The IPB2MZ is a 1080P network security camera that offers a variety of features, while giving a crisp and clear image during the day, and night. It is a bullet type security camera that has a 3-axis bracket that allows for easy mounting at virtually any angle on a wall, ceiling, or pole. With a 2MP Starvis image sensor combined with Starlight technology, this camera can see in color in very low light all the way down to 0.006 Lux; that’s basically color night vision. The camera also offers True WDR (wide dynamic range) which helps minimize glare or produce an even exposure of the video frame if the camera has both lit and dark areas in view. To learn more about WDR click here. Combine its ability to see in color in very low light with its 2.7-13.5mm motorized zoom lens, and you’ve got yourself a long range night vision camera. Like all of our motorized zoom lens security cameras, the varifocal lens of this camera can be adjusted remotely over the network or internet using either an NVR, computer, or smartphone. When the lens is at its widest setting of 2.7mm, you can expect to have a 106 degree view that can see faces up to 20ft away. When the motorized optical zoom lens is zoomed in all the way to 13.5mm, you can expect a 29 degree angle of view and facial detail up to a distance of 50ft. You can also expect this network camera to see general detail in complete darkness up to 200ft. Despite the camera’s long range IR intensity, thanks to Smart IR technology the camera is also capable of reducing infrared LED intensity when an object is up-close to minimize over exposure. Never miss any form of vandalism while this IP camera is installed and feel safe knowing it has motion sensing technology that pairs well with our NVR recorders to record on motion detection and send motion alerts. 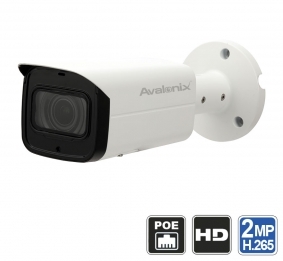 This security camera is capable of H.265 or H.264+ video encoding which requires up to 50% less video storage space compared to regular H.264. Since it is an IP camera, simply plug it into one of our PoE NVRs to begin recording. To see how easy it is to setup a security camera system using this camera and one of our NVRs, please watch the video demonstrating how to setup a NVR camera system. This security camera is IP67 weather proof rated, meaning it can handle outdoor weather conditions without needing any additional cover. It is both and outdoor and indoor camera. For power, you can either use one of our PoE NVRs for easy setup, provide power to the camera using a PoE Switch, or use 12V DC 1Amp power adaptor. Dimensions 9.6" x 3.2" x 3"
9.6" x 3.2" x 3"
Does this IPB2MZ have built in microphone. This IP camera does not have a built-in mic. You can find all security cameras with mic here.